Nike decides to quit her business career and let go of the comforts of home in her early thirties. She reduces her belongings to the essentials and buys an old sailboat in Panama. Even though she has very little sailing experience, she dreams to set sails with her boat that she calls “Karl” - all by herself. The casting off is a big challenge: The boat’s condition was a lot worse than expected, the engine fails continuously and the hull is damaged from corrosion. Quickly, two months of planned repairs turn into twelve. Nike is starting to doubt her own abilities and begins to wonder if she made a big mistake in buying such a work-intensive boat. 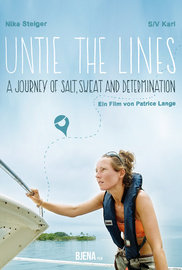 But she does not give up and finally makes her dream come true – she unties the lines. What follows is a fascinating circumnavigation of the Western Caribbean, a roller coaster ride through tears and utter bliss. Again and again, she has to leave her comfort zone. Watch Nike transform from a landlubber into a salty sailing woman, who adapted her needs and skills to the rules of the ocean, forming a beautiful unity between her and her boat “Karl”. 39 Comments. Add your thoughts.